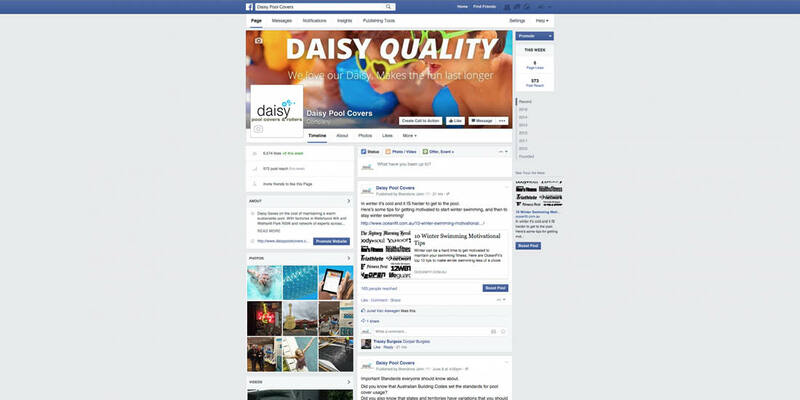 The largest pool cover and roller supplier in Australia, Daisy was exposed to market share cannibalisation. The retail sales market was also challenging as with getting the reseller channel engaged in supporting Daisy. Daisy engaged Brand One and One Digital to protect and build the business. Research into the market showed the trend in both in-store sales and online. The trend was moving more online but the traditional pool supply stores still played a very important role. Analysis was also conducted to see where the revenue was strong and where the opportunities were by state and by channel. It was clear that Daisy had an awesome product range and could credibly take the high ground in terms of quality of products and service excellence. As the best-selling pool cover in Australia with a full blooded Aussie products, we took the market position as ‘Australia’s Favourite’ backed by the evolutionary change (which save loads of costs in changing artwork on vehicles, POS and more as we could progressively change these) from ‘Daisy Saves’ to ‘Daisy Quality’. We brought family fun into the brand’s personality and backed it up with a full refresh in all collateral on and offline. A vibrant Aussie brand was born that resonated with the target market who loved water and summer! Cost Effective But Fantastic Summer Campaigns That Increased Sales! Summer campaigns were planned using the cost effective digital platforms predominantly backed by the sales team and point of sale material. It all worked seamlessly together with the result in increased sales last year and again this year!